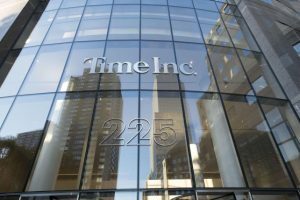 Time Inc. (NYSE:TIME) reported another drop in quarterly sales in the first quarter of its fiscal year, ended March 31. On its earnings call Wednesday, Time reported a loss of $28 million, or 29 cents per share in the first quarter, bigger than the loss of $10 million, or 10 cents per share, a year earlier. On an adjusted basis, the company reported a loss of 18 cents per share, more than the 15 cents expected by analysts on average. Total revenue fell nearly 8 percent to $636 million, missing the $642 million average of analysts’ estimates.. It was the fourth straight quarter of decline for the company. Print advertising revenue, which makes up a third of the company’s total revenue, fell about 21 percent to $212 million in the first quarter. The company slashed its quarterly dividend, lowering its dividend to 4 cents per share from 19 cents. Time has struggled in recent years, just like many of its peers in the publishing industry. Advertisers have increasingly been moving away from print towards digital media. The lion’s share of digital advertising dollars goes to Facebook Inc. and Google. The magazine publisher has announced that it is moving ahead with a cost-cutting plan, including selling some magazines or other properties. Chief Executive Officer Rich Battista said on a conference call that the publisher would look to offload “relatively smaller” titles in its portfolio and other “non-core” assets, but did not specify what those assets may be. Some of Time’s smaller titles include Sunset magazine and the UK-based What’s On TV. Time is also the publisher of Sports Illustrated and Fortune magazines. Time has also said that it will be increasing its focus on digital media. In the latest quarter, digital advertising sales surged 32 percent to $119 million. In the fall, Time plans to introduce a Sports Illustrated online video service as part of its growing push into video. Battista also said that Time would be open to joint ventures with other companies. The publishing company has spent months restructuring its business and replacing senior management. Changes to its board of directors were also recently announced. Dan Rosensweig has been named to Time’s board. John Fahey, currently the board’s lead independent director, has been appointed non-executive chairman. The moves come after its decision to not sell itself, ending speculation about a potential merger with Meredith Corp., a U.S. broadcasting and publishing group. Time was said to be holding out for more than $20 a share. Time’s shares have fallen 17.5 percent since it announced the decision to take itself off of the market.